Amid all the grumbling about filth on West End Lane, it’s always worth casting an eye elsewhere to see whether we can learn from others. Or to put our own woes into perspective. 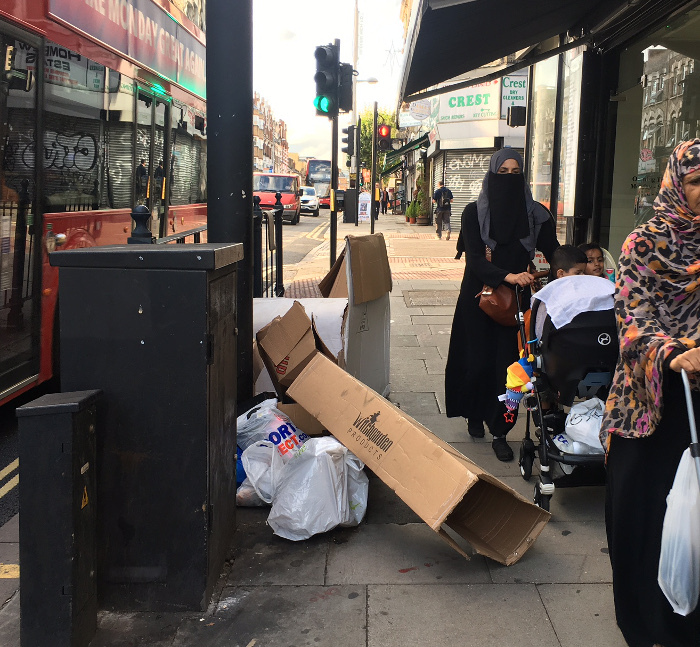 Recently, there have been some despairing tweets about the clutter, litter and, general grime on Kilburn High Road (this includes responses from one of the local councillors). 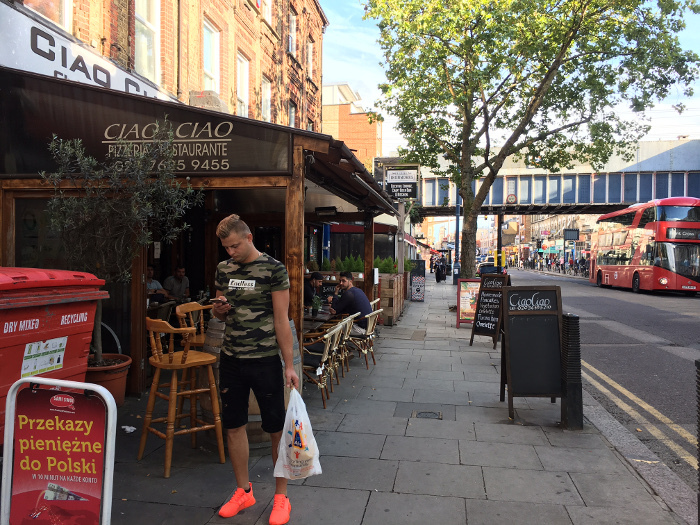 We went to take a closer look down the Camden side of the road. We started up by the railway bridge near the junction with Maygrove Road. And it didn’t take long to see the first of many (illegal) A-boards. At this point I’m going to introduce the word “curtilage“. This means the defined area of a property’s land. Within your curtilage you can do what you want (within reason) – build a deck, put out goods or an A-board etc.. Beyond is the public highway and you cannot do what you want, whether it’s within reason or not. If the public highway is narrow then it is particularly important to keep it clear for pedestrian flow, buggies, wheelchairs and so on. It is the council’s responsibility to enforce that it is kept clear. 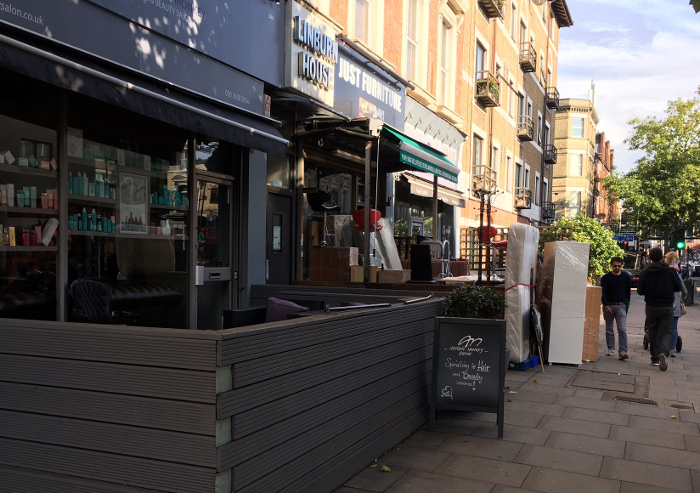 Further down, more A-boards appearing and furniture for sale. 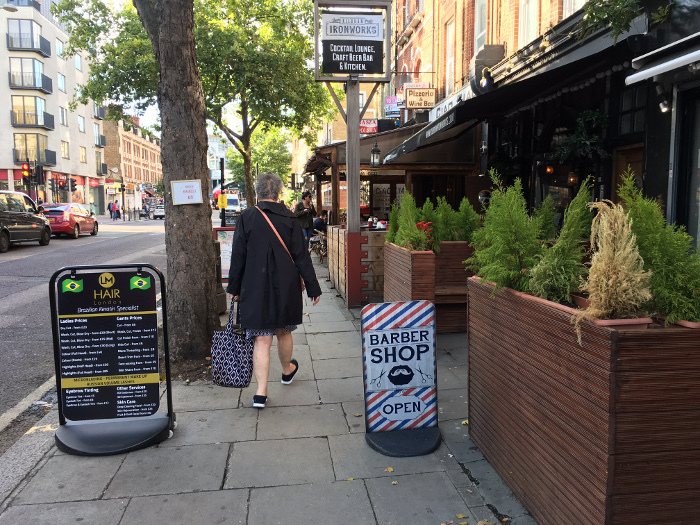 It gets worse along the really narrow stretch of pavement from 334 to 328 ; although most of the businesses have built out on their curtilage they then obstruct the remaining narrow pavement with A-boards and allow their chairs to spill off their land (and bins too). Adding to the confusion of where responsibility lies, this stretch is actually part of West Hampstead ward, not Kilburn. A bit further on we come to the Hilal Food Centre. 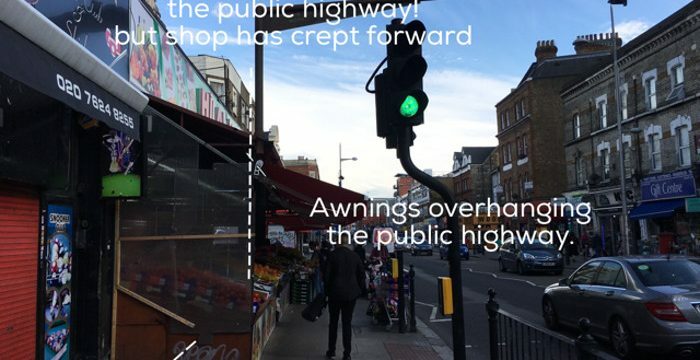 It’s a popular store – I shop there too – but it still has to obey the same planning rules as everyone else. It has ‘allegedly’ spread way over it’s curtilage and keeps creeping forward across the public highway. Their gain at our loss. Next up is popular pizza joint Quartieri, which had tested the limit by putting out chairs on the pavement and an A-board. However, it was slapped down pretty quickly and with a reputation to keep has been playing by rules since then. The Black Lion has been around for longer than most businesses on the High Road. 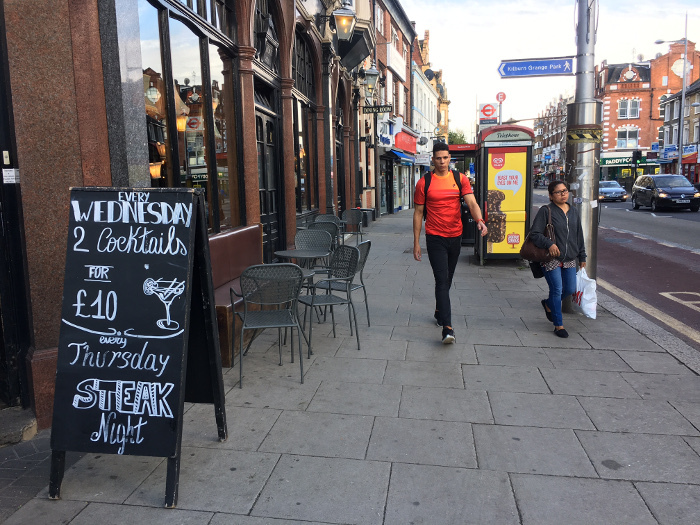 It has a nice outdoor space at the side – on its own curtilage – but has recently started putting out chairs and tables on the public pavement. Without planning permission, apparently. The pavement here is wide enough to take it, but it still needs permission guys. Next up, another pub. 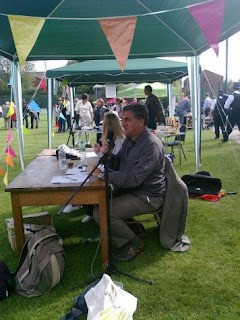 The Sir Colin Campbell has tables outside too, but – and here’s the important bit – these are on its own curtilage. And the A-boards are on it too. Cheers to the SCC for being a responsible business. I have spared you yet more photos of fly tipping thus far – there was certainly plenty of it, but at this point we reached a particularly egregious case, some of which appeared to have come from the other side of the road. Why did the fly-tipper cross the road? Because enforcement is tougher on the Brent side. Cllr John Duffy, a Labour Councillor in Brent, ensures that fly-tipping (and planning breaches) are dealt with and followed up. 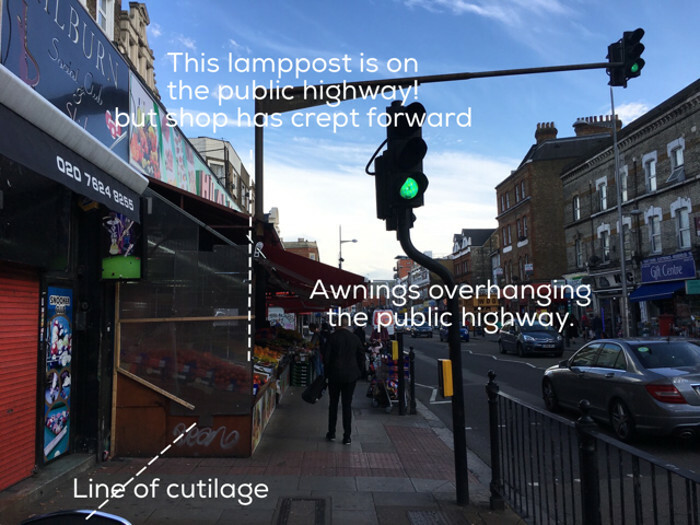 This doesn’t seem to happen as effectively on the Camden side of the road, although the local councillors tweet the tweet! 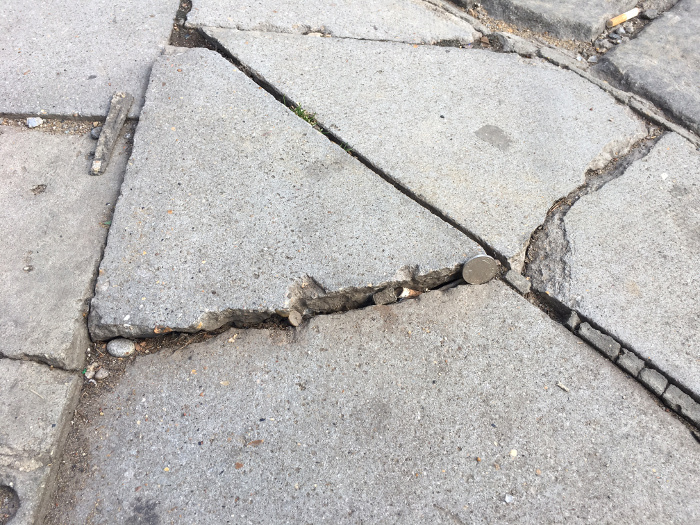 Camden can however take credit for the physical state of the pavements and for the state of the road. 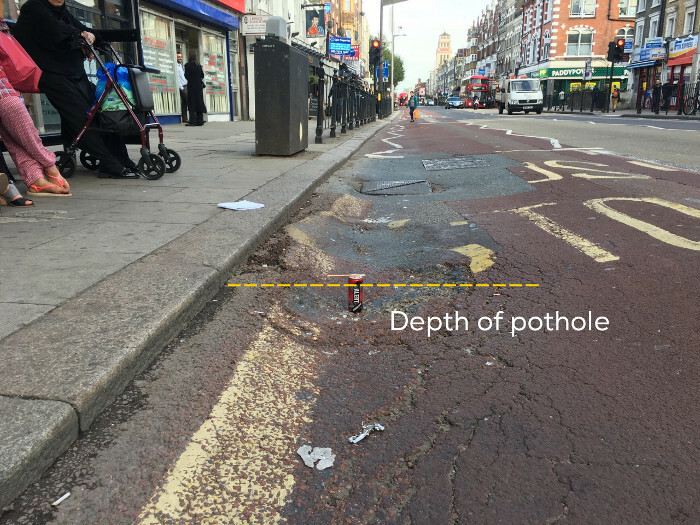 Any cycling readers will know that the northern end of Kilburn High Road is in a terrible state, with potholes big enough to cause an accident. But once you pass Quex Road, the surface improves and it’s fine from then on. The reason: in an effort to do some of that famed joined-up thinking, Camden is responsible for the road on the lower section below Willesden Lane and Brent for the upper section. 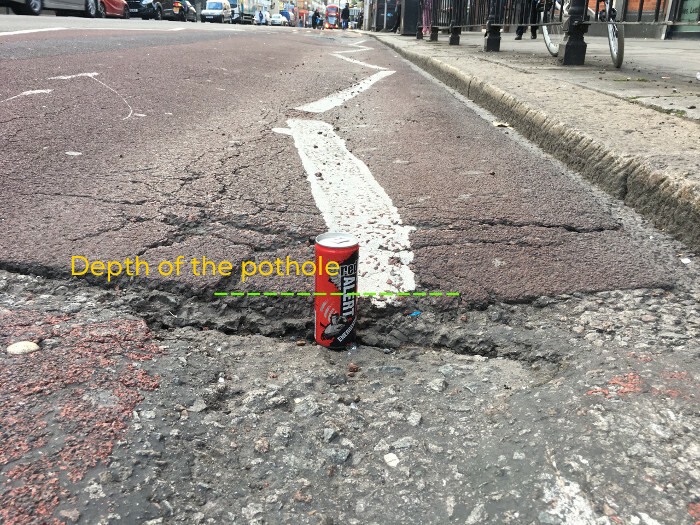 Camden has met its responsibilities, while the potholes suggest Brent has not. There is a noticeable difference in the pavements too. On what I understand is the part Brent is responsible for, but in ‘Camden’, there clearly potential trip hazards. WHL checked with Camden on this as it sounds a bit odd and even they weren’t sure. Clearly a trip hazard. Damages in case of injury would be a lot more than 10p! 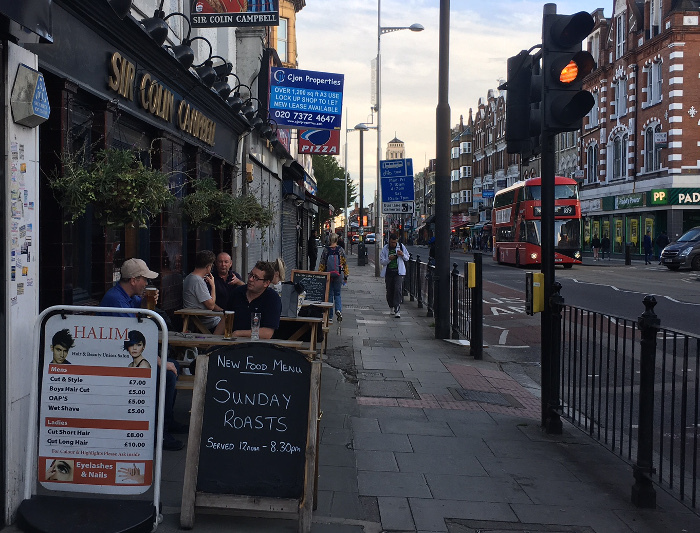 Kilburn High Road marks the boundary between Camden and Kilburn (with Westminster and Barnet also getting involved at the southern and northern ends) and somewhere that’s on the periphery for all councils is always likely to struggle to get the attention of borough heartlands. There are added complications that even within one borough, the road passes through multiple wards, but that shouldn’t have an impact on enforcement. Aside from aesthetics, why should this be of such a concern? For a start there’s the ‘broken windows‘ theory (general deterioration leads to bigger problems), and certainly the deterioration of our streets has coincided with a rise in crime. And as if that wasn’t enough, living in a cleaner more pleasant environment is less stressful, which given that Camden has some of the highest rates of mental illness across the country – with almost 50,000 adults in Camden experiencing anxiety and depression (20% higher than national levels), would be one more reason to strive for cleaner streets and a decent public realm. 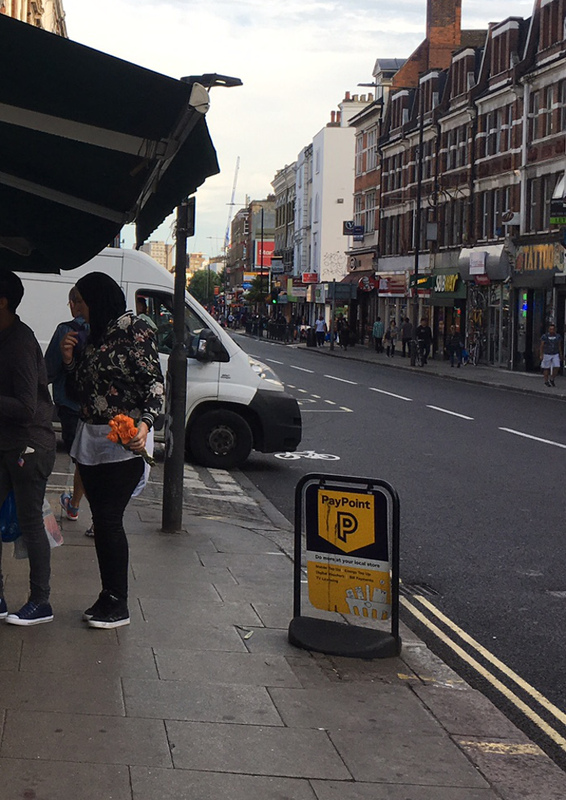 Finally, WHL has been getting flak from local Labour activists about the number of tweets on the state of our local streets (don’t worry we get flack from the Tories too, about different issues – so we must be doing something right). 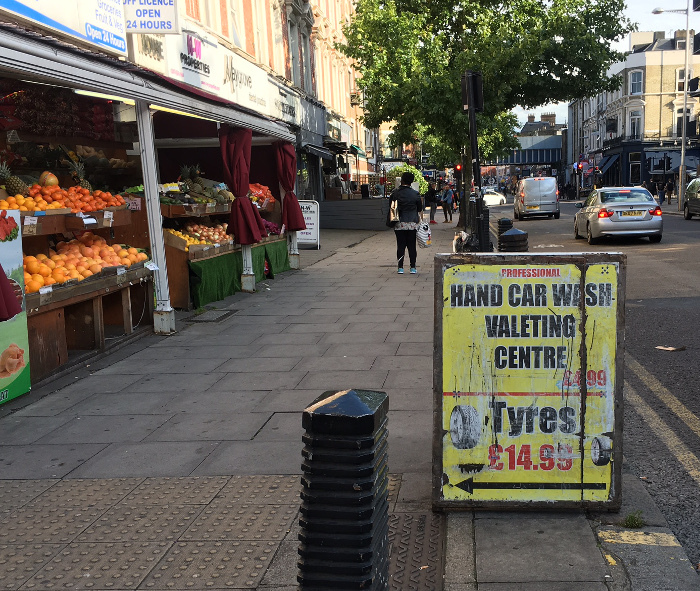 They have said we should mention the Clean Camden App, and this we are happy to do. Just done it. WHL is a regular user but there are some things it can’t do (e.g. report those broken flagstones, or bins left on the pavement). Nor have we heard from Camden about how effective it is. In a nutshell – to paraphrase a former Prime Minister; we need to not only be tough on grime, but tough on the causes of grime.